VW's new Polo sedan was developed for Russia's harsh climate and bad roads. Volkswagen unveiled a sedan variant of its Polo small hatchback developed for Russia's tough climate and driving conditions. VW said it carried out long-term tests in different climate zones and in various street conditions in regions of Russia during the sedan's development. The available gasoline qualities were also tested repeatedly. As a result, VW said in a statement, the sedan has a reliable engine suited to operating conditions prevailing in Russia, as well as a non-corrosive body and a wheel suspension geared to bad roads. Robust paints were used for the car's paint job and the chrome parts are also highly resistant to aggressive agents. Frank Wittemann, head of VW brand in Russia, said the Polo sedan will add a small family car to the company's Russian lineup that includes the Passat and Jetta. 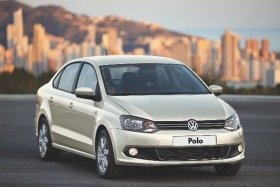 The Polo sedan will sell for just over 10,000 euros in Russia, Witteman said. The car is equipped with a 105-hp, 1.6-liter engine and is built at VW's plant in Kaluga, south of Moscow. VW brand new-car sales fell 12 percent to 12,942 in Russia in the first four months in a market down 13 percent to 456,179, according to data from the Association of European Businesses in Russia.